‍Preheat oven to 350F and line baking sheets with parchment paper. ‍In large bowl, blend butter and sugar until creamy. ‍Add egg yolk, cream, vanilla, and mix well. ‍In separate bowl, sift flour with baking powder and salt, add to butter mixture and combine until smooth. ‍Form dough into small balls and dip in egg white, then roll in crushed nuts. Place on baking sheet about one inch apart. ‍Make a small indentation with thumb on each ball before baking. ‍Bake for about 20 minutes until lightly golden. 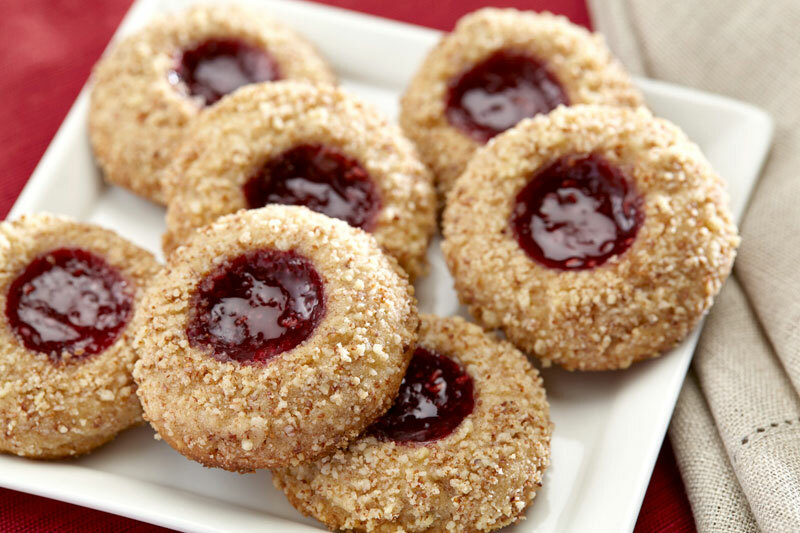 ‍While still warm, spoon a tiny bit of jam into thumbprints. ‍Let cool for several minutes before removing to wire rack. It looks like Christmas. It’s still November. Start baking. Thankfully our LA weather has finally turned to something like autumn. Those of us who love this season might just be inclined to start baking things that equal something like Christmas. Never mind the astute wisdom of the aforementioned dog. In my messy organization of recipes earlier today, I came across the recipe and story of one of my favorite cookies that I used to bake with my mom every single year. I’m not sure why it fell out of the stack I was looking through, but maybe because in fact it’s share worthy - again - here and now. My story had just been published in the newspaper, about my father’s last Christmas here on earth. Only when I sent the story off, he had just come home from the hospital and I didn’t know it had been his last Christmas. By the time the story appeared in the paper, he had died. It was the beginning of January 2002. With hope for a lovely new year, I shared my cherished recipe for Swedish Butter Cookies that I had just baked a few weeks before. My final comments were to say that most of us like to watch our cookie intake in January so, I recommended tucking the recipe in a safe place for the time being. When December (or, November) comes calling, no one thinks so much about swimsuit season. Most have the holiday’s best sweets on the brain, and this cookie is surely one of those. Maybe you will add them to your own Holiday Cookie Parade.